Argentinian-born Thai artist Rirkrit Tiravanija is known for challenging the conventional notion of art spaces by cooking in them—whether it is with the installation, Untitled 1990 (Pad Thai), where he served the Thai noodle dish to visitors at New York’s Paula Allen Gallery in 1990, or most recently Untitled 2018 (The Infinite Dimensions of Smallness), where museum-goers to the National Gallery Singapore’s Ng Teng Fong Roof Garden were invited to stop by for tea within a large-scale bamboo maze. This spirit of taking art beyond the visual to foster social interactions is an element that Tobias Rehberger shares in his artistic practice. Renowned for his bold visuals, the German artist transforms everyday spaces for eating and drinking to immerse the viewer in his work. In 2013, he created a temporary replica of his favourite Frankfurt bar in a New York hotel, covering it in bold geometric patterns and flashes of vibrant orange and red. His design for the cafeteria at the 53rd Venice Biennale won him the exhibition’s Golden Lion for Best Artist. 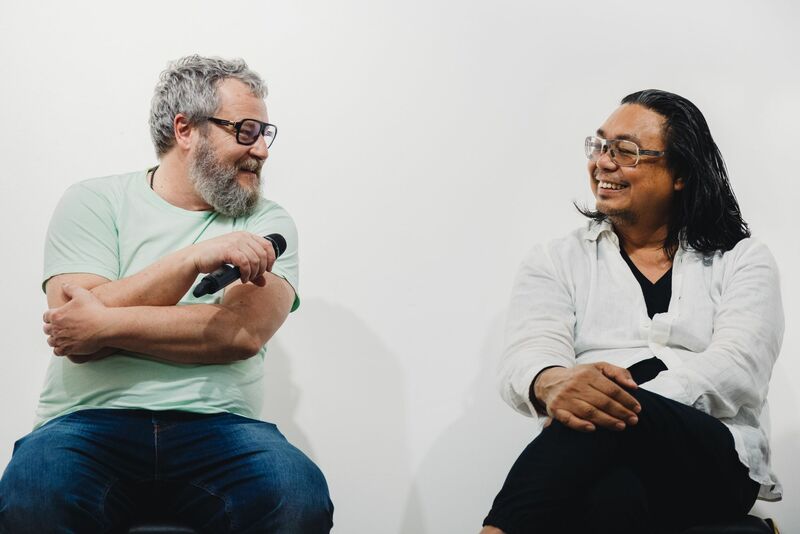 The artists, who are also frequent collaborators and close friends, will share their affinity with food and art with guests at the “Artist Cooks” Supper Club, which is part of the event line-up at the inaugural S.E.A. Focus boutique art showcase organised by STPI – Creative Workshop & Gallery. Putting on chef’s hats, both Tiravanija and Rehberger will take guests on a multisensorial journey as they cook up a cross-cultural feast at the Siri House by luxury Thai property developer Sansiri in Dempsey Hill. Held on January 24 and 25, the two pop-up dinners (which has since sold out) feature a specially curated menu that reflects Singapore’s rich multicultural heritage. We sit down with the amateur chefs before they hit the kitchen. You are both known to explore the relationship between art and food, and the social interactions they foster. Rirkrit, you especially have served up numerous meals in galleries and museums. How is food (or cooking) a medium of art? Why is it important to you to engage your audience with art? Rirkrit Tiravanija (RT) We were actually having dinner last night with a chef and he was asking the same question. Well, if the food is good, it’s food. If it’s not, it’s sculpture—which is actually what I’ve said before! It’s kind of like when you make dinner at home, people come, and everyone goes to the kitchen and stays there—that’s what I’m interested in. It brings people together. Because sometimes, when I don’t cook fast [enough] and people start to help me, that becomes another level of interaction. In a way, it’s very primal like in the past when people used to get around the fire to be together. Tobias, why do you choose to exhibit art in food and drink spaces? Tobias Rehberger (TR) It’s just one of the possibilities of many spaces that can encompass different functions. I’m more interested in spaces where you’re not meant to view art. For example, one of the reasons why the cafeteria at the Venice Biennale was so confusing was because I’m not interested in looking at art, but being with art. It’s not so confrontational, but more about what’s around you than staring at something. If the food is good, it’s food. If it’s not, it’s sculpture. Is Rirkrit a good cook? RT Sometimes! There are moments. RT The chances are very high… (laughs). If something goes wrong, like I said, it becomes sculpture! TR I think there’s a difference in your food because of the intention of why you made it. If it’s for someone else to eat, or if it’s supposed to be a work of art, you know? The menu you will be preparing for guests at Siri House is inspired by Singapore’s rich multicultural heritage. Can you tell us briefly about the dishes, and your inspiration behind them? RT This project is different because, well, we were asked to make dinner. Our approach has always led us to question, ‘what can we do together?’ So, in a way, it’s a combination of things we’re interested in eating and doing. We have this dish that features poppy seed potato noodles with fish sauce ice cream on the menu. Singapore is the definition of crossroads cooking, even the idea of Peranakan food is a mix of cultures. Therefore, our food is somehow like that too, that particular dish showcases both of our cultures as well. The potato noodle with poppy seeds is an Austrian dish, while fish sauce is a widely used Thai ingredient. TR To give another example, the pizza as we know it has been shaped by how the Americans and Italians produce it. Pad Thai wouldn’t be possible without the invention of noodles by the Chinese. So, it’s a cultural continuation that takes place in the kitchen. What would you say is the common thread between your artistic practices? TR We’re not interested in staring at art. RT We’re interested in some other kind of experience with art. TR There has to be a bigger capacity of understanding and experience as there’s more to art than just the visual. If you had the opportunity to host a dinner with art world figures, living or dead, who would you like to invite to the table, and why? RT Tobias had a birthday that went on for 50 hours non-stop—so imagine that. Besides being collaborators, you are also close friends. Can you share with us a trait about the other person that many don’t know about? RT Everything I know about him, nobody would know! On the other hand, the more I think about it, it seems that everybody knows everything about Toby since he never goes to sleep, so you’ll see him at every stage. You won’t miss him! I’m probably the opposite! TR Oh no, that’s not true. But we’re always the last ones standing when it comes to drinking, but everyone knows that about us! S.E.A. Focus is held from January 24 to 27 at the Gillman Barracks.